Tod and I are chomping at the bit to get the Pennsylvania sections of the AT completed. Thus, it may not surprise you to hear that we did three days of hiking in the middle of January. Weather was iffy and we agreed not to hike or backpack in dangerous conditions. However, the forecast brightened and we were off! 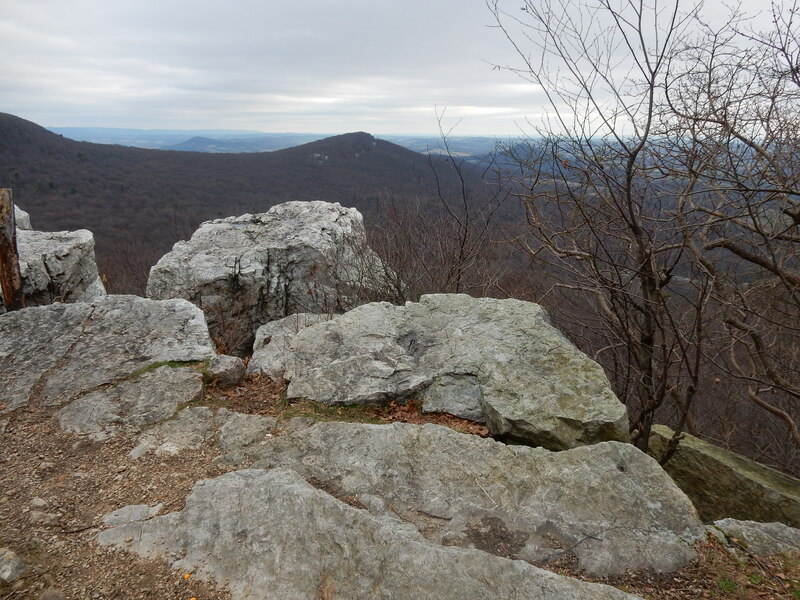 The first day was a 5+ mile hike from Lehigh Gap to Little Gap. 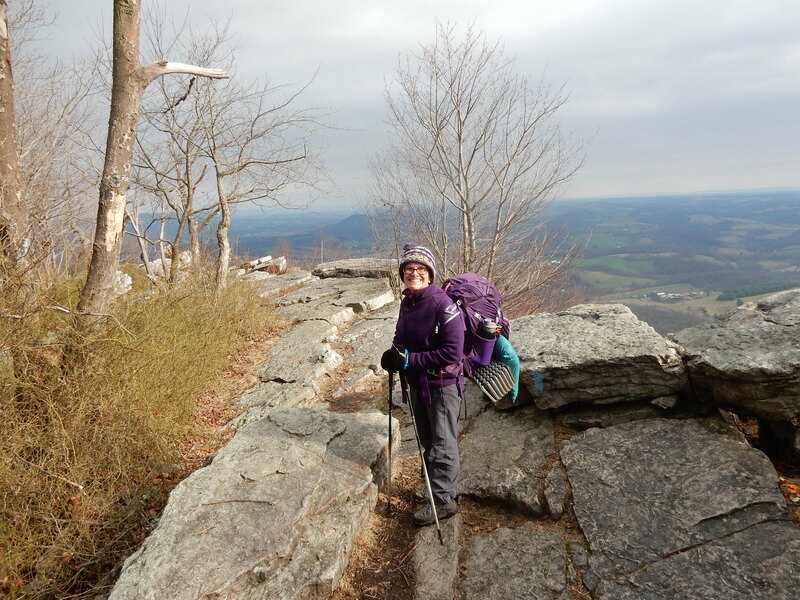 If you’ve ever read a thru-hiker’s book, they almost always seem to have a picture from the top of Lehigh Gap to illustrate the beauty – and rigor – of the hike. The trail quickly comes to a vertical 1000 foot “hike” that is really rock climbing. As we approached the foot of the trail someone coming from the opposite direction said, “It’s windy up there!” Boy, was she right. I’m a wimp when it comes to climbing. It helped to focus on putting one foot in front of the other, moving my hand to the next best rock. I didn’t spend much time looking down. I was able to conquer fear and make it to the top. I would have jumped up and down with my hands in the air like Rocky Balboa had it not been for the fact that the top was just as rocky as the face of the cliff. Tod was very supportive as I growled and groaned. I have no idea how solo hikers do it. 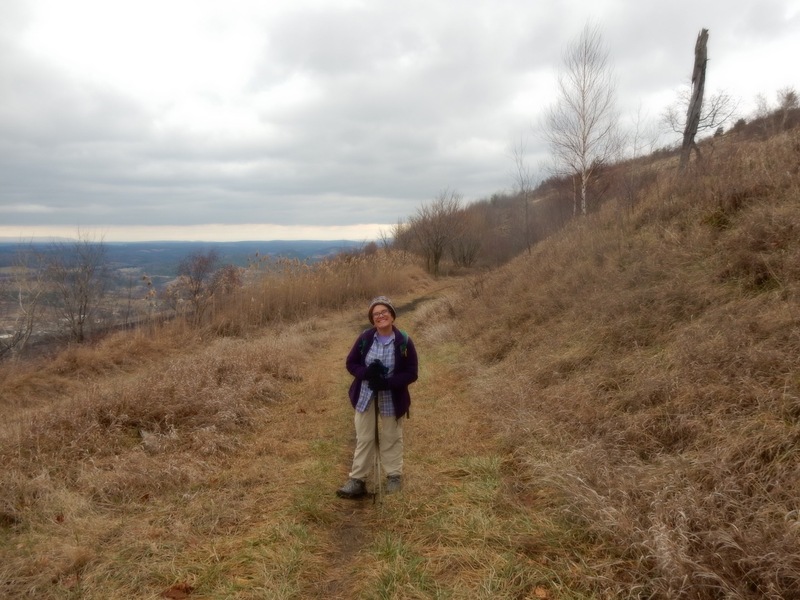 The rest of the hike was through a section of the AT that is diverted onto a grassy trail designed to try to avoid a superfund clean up site. I know. It doesn’t sound pretty and it really wasn’t. One quirky thing about this area is that the blazes were, well, interesting. There were lots of double blazes in areas where there was no change in trail direction. Near the power lines we saw some huge, footlong, super wide blazes along the rocks. On a positive note, this part of the trail was really easy and it wasn’t long before we were at Little Gap. We stayed overnight in a hotel and were back on the trail the next day by 8:15 am. The weather looked good and we were looking forward to a night camping at a shelter. The hike began in a pretty swampy area, but we quickly made it to the top of the ridge. Imagine what a surprise I had when I looked to my left, only to see people skiing a few yards away! (This isn’t something that most thru hikers would see.) I guess the Appalachian Trail goes right by Blue Mountain resort. I felt some kinship with the skiers since they also like to be outdoors in the winter. We stopped to make lunch at 11:30 am and by 1 pm we had gone at least 8 miles. Then, it started to snow. This wasn’t expected and made things a bit slippery. 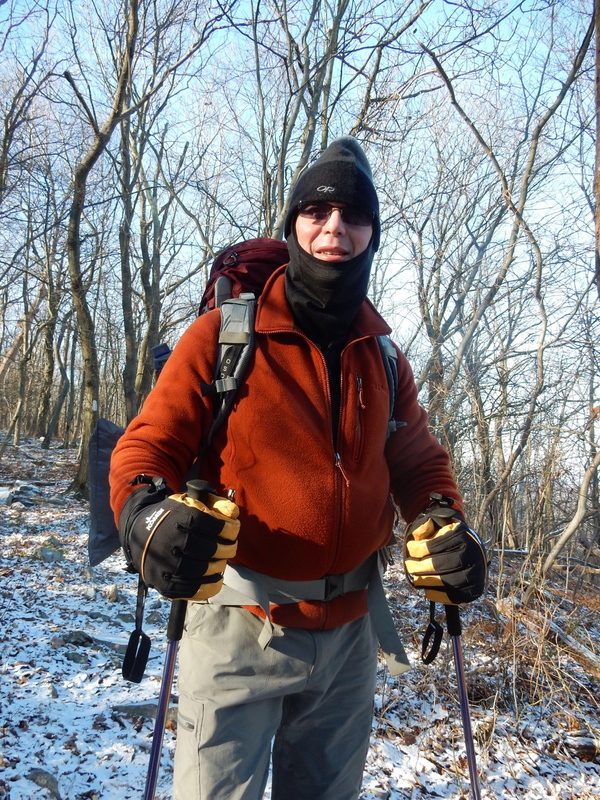 Had we not been so tired, and had it not been winter, we probably would have gone the whole way to Wind Gap (about seven additional miles), avoiding a night outdoors. Instead, we tried to make the best of the situation by arriving at Leroy Smith Shelter and setting our tent up inside the shelter. My favorite part of the trip was hanging out at the shelter, drinking coffee, and watching the snow. Everything was silent. Peaceful. It was really beautiful. Tod and I made dinner and were in the tent ready to sleep by 7:15 pm. Even though it was well below freezing I was warm. By the time we got up in the morning it was 11 degrees, not including windchill. Our stove/fuel had frozen, and making breakfast was not possible. The rest of the trip was a bit like being in survival mode. Packing things up in the cold was not easy. Most importantly, Tod’s fingers were in a lot of pain. (Tod has lived in Alaska and his fingers have had frostbite.) 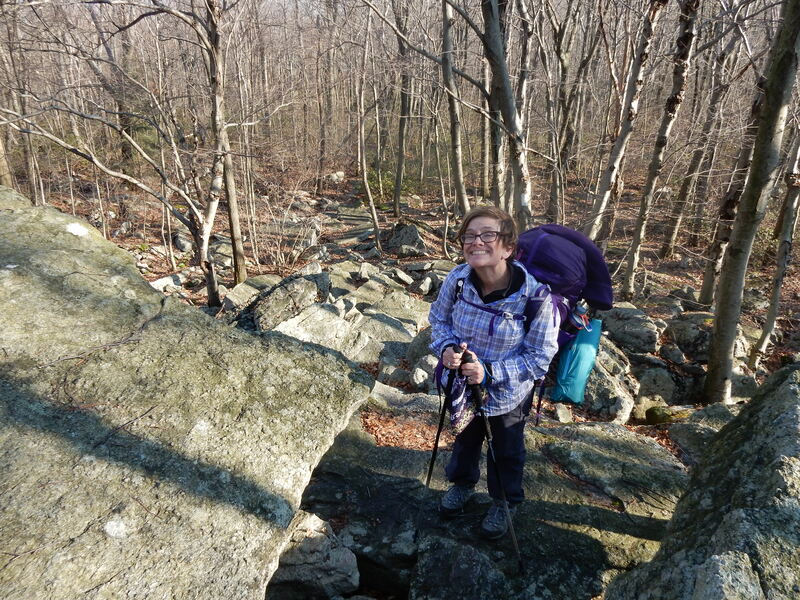 Luckily, the hike to Wind Gap had several things going for it: beautiful views, bright sunny weather, few inclines and manageable rocks. In no time, we arrived at Hahn’s Lookout. We quickly made our way down to the Gap and to our car. I’m pretty proud of us for doing so well hiking in adverse conditions. 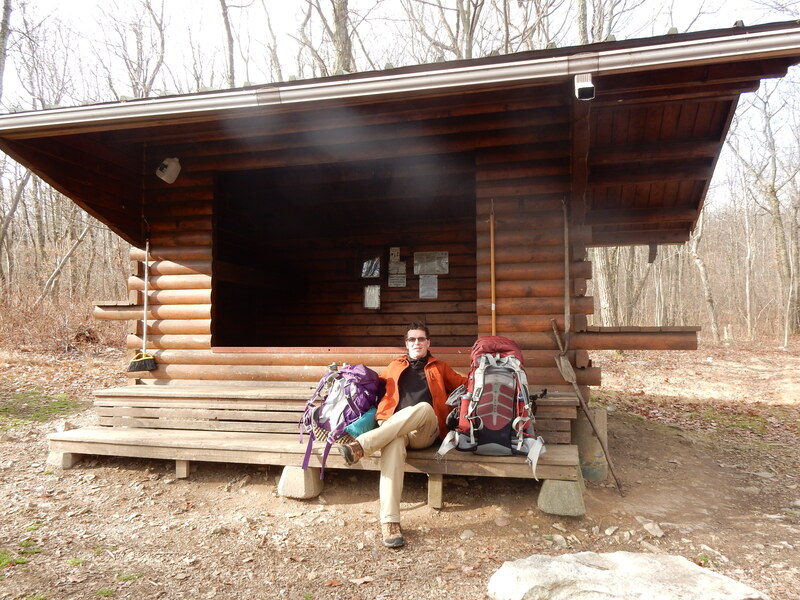 Part of the fun of hiking and backpacking is testing yourself and being successful. Certainly, proper clothing and equipment is key. I had five layers on and was toasty warm. In the future, we won’t forget to bring the cooking equipment into the tent with us when we go to sleep so that it stays warm. Next time? New Jersey, here we come! 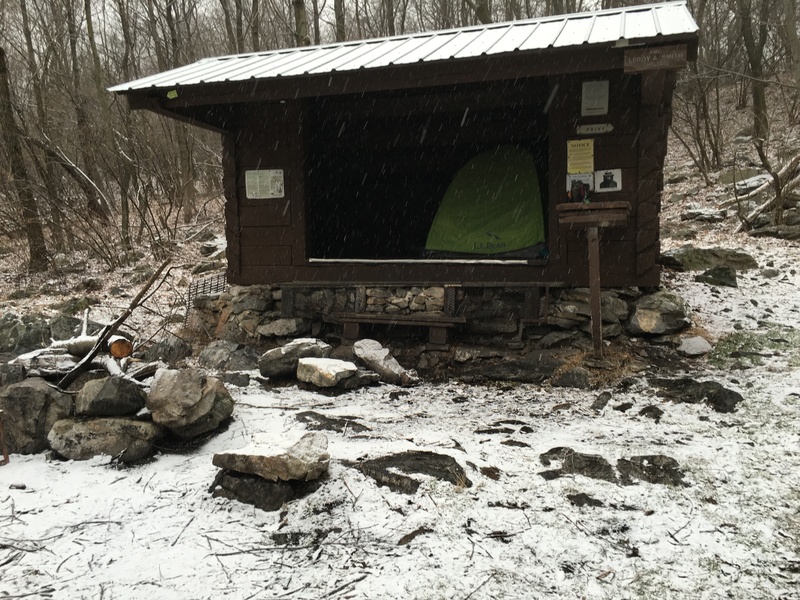 Regardless of freezing temperatures, Karen and I decided to close the old and bring in the new year, 2016, on the Appalachian Trail. We returned to Port Clinton and parked off of Broad Street. There we picked up the trail, passed under highway 61, and clambered up Blue Mountain once again. On top of the ridge, we had the usual rocky path before us and no noteworthy obstacles. The trail does descend to Pocohontas Campsite and Spring only to reascend shortly thereafter—a rather pointless down and up for us. 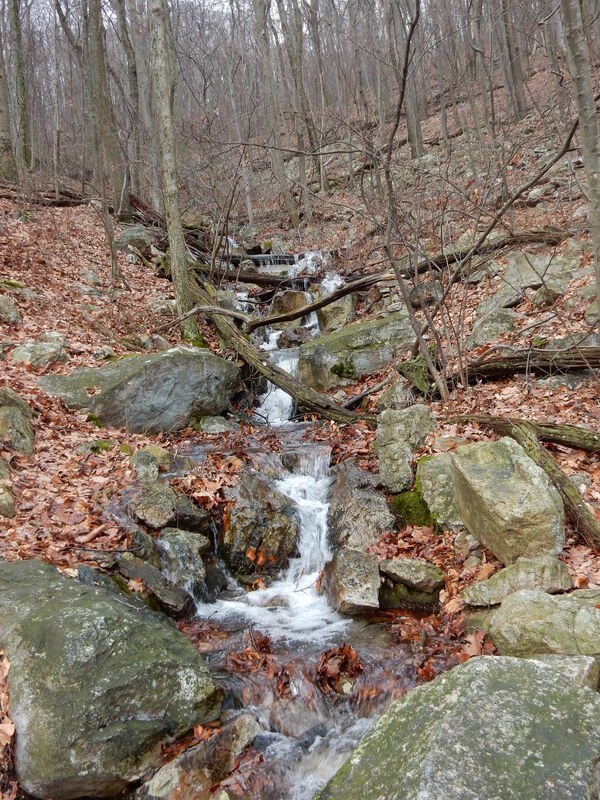 Again, the trail descends a bit to Minnehana Spring. Both springs are on the KTA map, and both are active, though Pocohontas is the better of the two for gathering water. 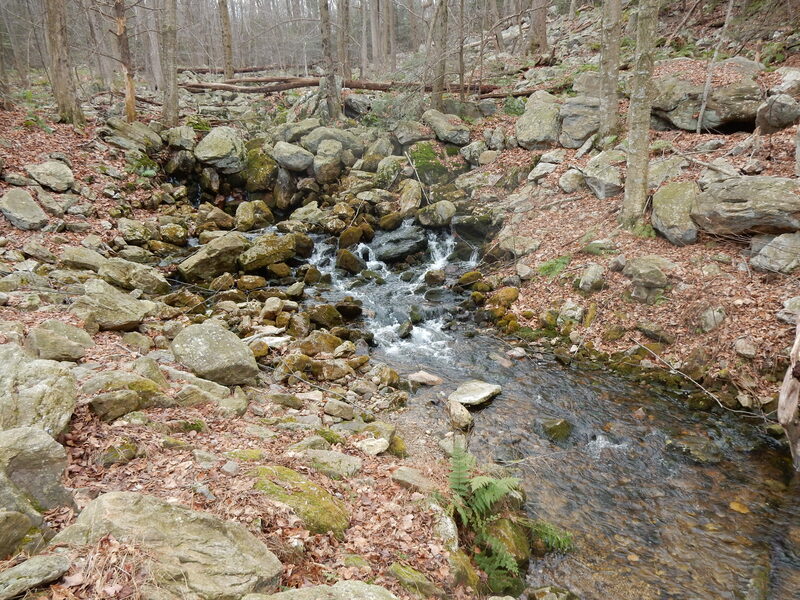 What is not on the map is a rapidly flowing creek between Minnehana Spring and Furnace Creek, above Hamburg Reservoir. Had we urgently needed water, this would have been the best source yet. See the photo below. 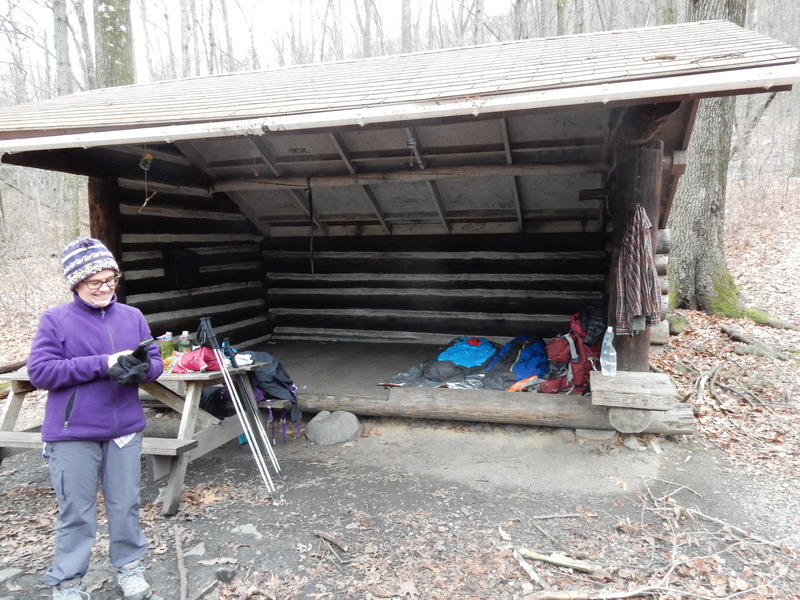 Karen and I stayed toasty warm in our sleeping bags and liners. In fact, so comfortable were we, buried in the darkness of our bags, that we failed to notice the morning light and didn’t arise until 8:30. Within an hour, we were back on the trail. 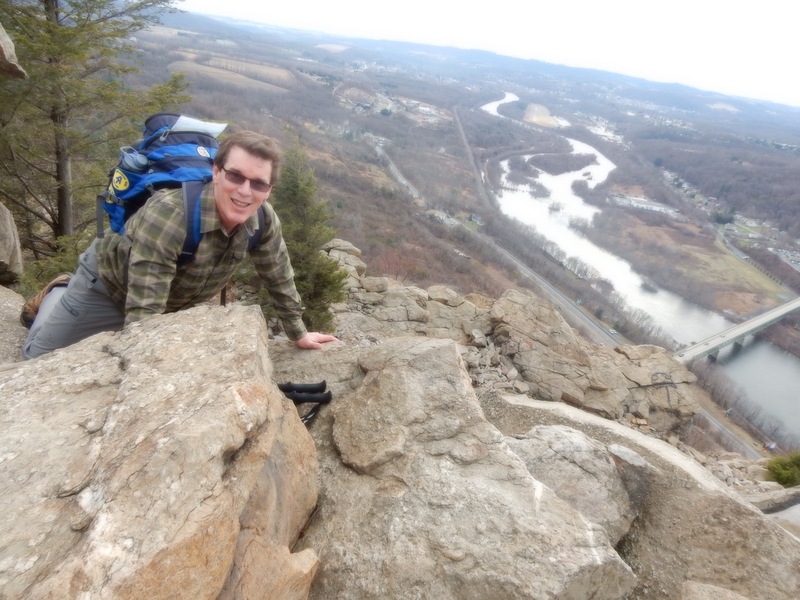 As we scrambled up and over the boulders at Pulpit Rock, Mike and Wyatt caught up with us. This was as far as they were going. They were the first to whom we wished a happy New Year. Karen and I paused to take a picture of ourselves before the overlook and, then, quickly got on our way. Soon we arrived at the Pinnacle, and as we arrived the temperature suddenly dropped and snow flurries started to fall. A dozen or so day-hikers arrived just behind us. We carefully found our way across the rocks to the overlook, took in the view, but didn’t stay to fully appreciate the spectacle. A frigid breeze and darkening clouds prompted us to be on our way. From the Pinnacle to Eckville is the easiest AT in PA. The path is, until perhaps a mile from Eckville, broad and relatively flat and smooth. The only drawback is that the trail is wet and muddy up until it reaches a junction with the blue trail favored by day-hikers. Although the map doesn’t show it, the trail crosses Pine Creek over a bridge, and shortly thereafter it darts back into the woods. It emerges at Hawk Mountain Road. There is no sign to indicate that Eckville Shelter is just down the road a ways. Karen and I, expecting a sign and a blue trail to lead us to the shelter, continued to hike another half a mile before we came to the conclusion that we must have missed it. Retracing our steps was a hard thing to do, especially at the end of the day, and on our way back to Hawk Mountain Road, we picked out a spot to set up our tent should we fail to find the shelter. Yet, find it we did. There was a hardly noticeable blue blaze down the road, pointing us in the direction of a white house, behind which is the shelter. We were Eckville Shelter’s first occupants of 2016. The place had been winterized, so there was no electricity and the privy was closed, but the spigot coming from the house provided us with water, and the four walls kept us out of the wind. The place has two sets of bunk beds on one side, and another set and a table on the other side. Soon after setting ourselves up, and while we were preparing our dinner on the picnic table outside, the associate caretaker and ridge-runner, Scott B., appeared. We thanked him for his hospitality, and he shared with us some of the history of the local trail. Shortly after the sun had set, we gladly slipped back into the warmth of our sleeping bags. Saturday morning we arose at 7:00, after another twelve-hours’ sleep. The temperature had dropped into the 20s over night, and the sun had yet to make itself felt. After a breakfast of hot oatmeal, we donned our packs and hit the trail. Ahead of us was our highest ascent of this trip, again up Blue Mountain. Once upon the ridge, the trail became rockier than we had experienced during the first two days. We scrambled up Dan’s Pulpit and, then again, we scrambled across the Balanced Rocks. 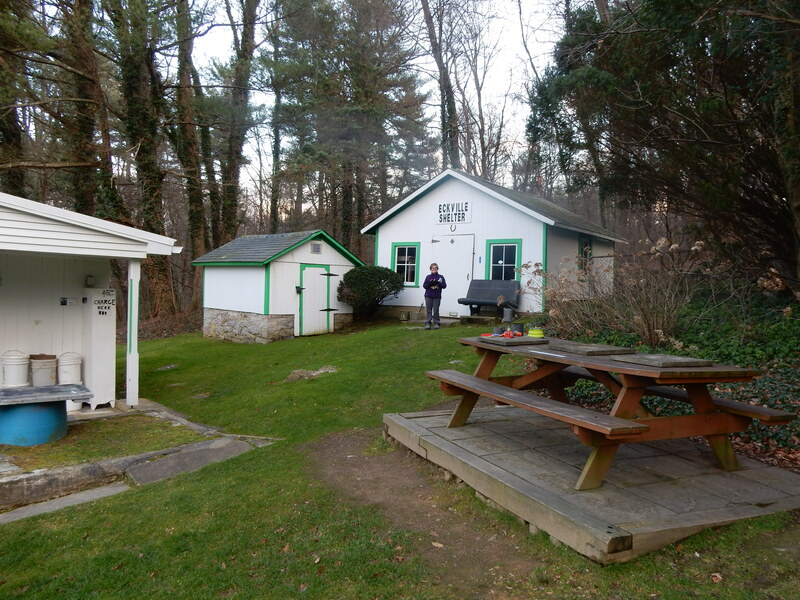 After five-and-a-half hours of hiking, we finally reached Allentown Shelter. This is a much nicer shelter than Windsor Furnace. It is set higher off the ground, and has a bunk platform on each side of the interior, and a table built into the two sides of the exterior. We made ourselves a hot lunch and basked for a few minutes in the near 40-degree warmth of the sun. 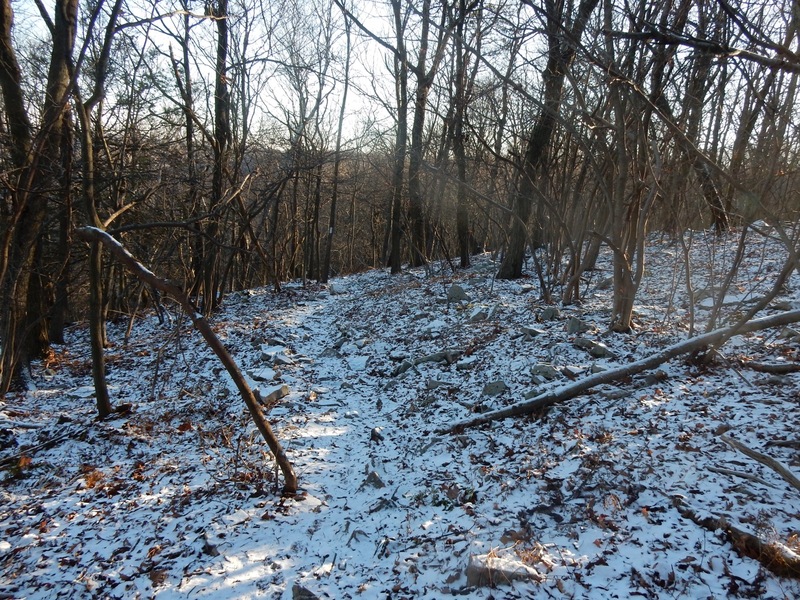 From Allentown Shelter, the northbound trail follows, for about two miles, an old, abandoned dirt road, which allows for faster and less treacherous walking. By this time, the bottoms of my feet ached from the constant pressure of rock edges, so I was ready for this change. So, too, was Karen, whose back was now aching. 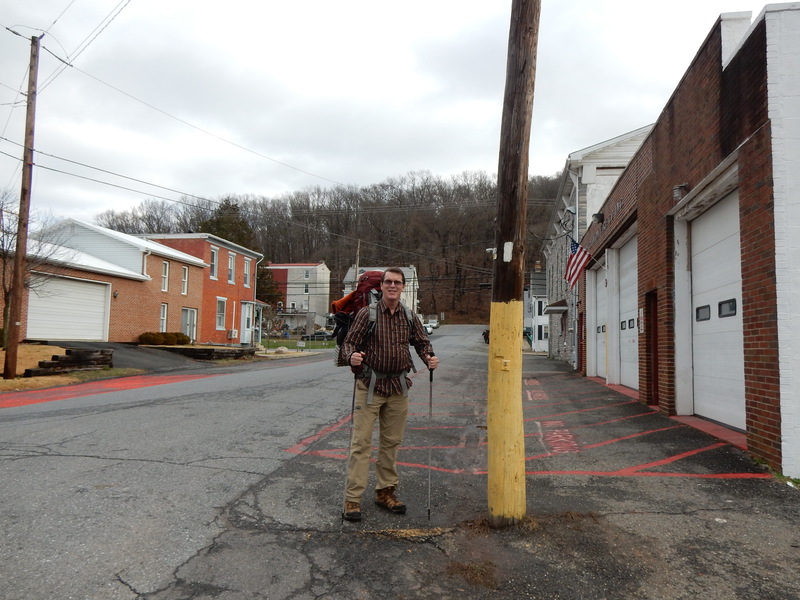 In an hour and twenty minutes, we covered the last four miles to PA 309. It had been a delightful and memorable adventure. What a great way to begin the new year!